Days before the New York Times reported a June 2016 meeting of Kremlin-linked figures and Donald Trump’s inner circle, an attorney for Donald Trump Jr. told another attendee of the meeting that there were no plans to go public about it, according to the attendee’s testimony to the Senate Judiciary Committee. The attorney Alan Futerfas warned the attendee Ike Kaveladze that it might leak anyway, Kaveladze told the committee. Kaveladze’s recollection of his June 2017 phone call with Futerfas was one of many new details — disclosed among thousands of pages of materials the committee released Wednesday — that capture how Trump-world attorneys scrambled to get the story straight about the combustible meeting well before it became public. Their flurry of communications was set off by the discovery by Jared Kushner’s attorney of an email sent to Donald Trump Jr. and forwarded to Kushner in which they were promised information that would “incriminate” Hillary Clinton. The email was discovered, the Washington Post reported, as Kushner’s attorneys were preparing to respond to the inquiries of the various congressional committees probing Russia’s election meddling. Kushner in his prepared statement to the Senate Judiciary Committee claimed he did not notice the promise of Clinton dirt offered by Rob Goldstone, who set up the Trump Tower meeting, and only at the time saw Trump Jr.’s email at the top of the chain asking Kushner to attend the meeting. Well before a Trump-world attorney started asking around about the meeting, another meeting attendee started to think about what would happen if it became public. In the spring of 2017, Rinat Akmetshin, the Russian-American lobbyist who attended the meeting, contacted fellow attendees Natalia Veselnitskaya, a Kremlin-linked lawyer, and Ike Kaveladze, according to his testimony. Before the meeting did become public, Trump attorneys attempted themselves to nail down the details. The Washington Post reported that Kushner’s attorneys were first to stumble upon the email that Rob Goldstone, a publicist who had worked with the Trumps in the past, sent to Trump Jr. to set up the meeting. It’s not clear from WaPo’s report when the Kushner attorneys discovered it, but by early June 2017, Trump-world attorneys were reaching out to those involved. Alan Garten, a Trump Organization attorney, got in touch with Goldstone. On June 2, Goldstone sent an email to Garten disclosing Veselnitskaya’s name, according to the materials released Wednesday. Around this time Goldstone and Garten also discussed the meeting on the phone, Goldstone told the Senate committee, and Garten asked for the contact information for the others who attended. Goldstone mentioned Kaveladze, who he described as attending the meeting as a representative of Aras and Emin Agalarov, a Russian oligarch and his pop star son with previous connections to President Trump. On June 3, Goldstone in a text flagged for Kaveladze the “interesting” call he had with Garten. Garten and Goldstone would have multiple conversations about the meeting, Goldstone testified. “He said, at the time, that there had been some leaks,” Goldstone told the Senate committee. Garten reached out to Goldstone over email again on June 26 seeking to chat. The next day Goldstone emailed Garten contact information for Kaveladze. Around this time, Futerfas, Trump Jr.’s personal attorney, also hopped on the phone with Goldstone to discuss the meeting, Goldstone testified. On June 27, Goldstone also messaged Emin Agalarov to report his phone calls with the Trump attorneys and the “massive problems” the meeting has caused. Goldstone also forwarded to Kaveladze his email to Agalarov. Asked in testimony what he meant in the email, Goldstone brought up press reports about Trump-Russia connection, but said the attorneys had raised the concerns as well. Meanwhile, Futerfas made contact with Kaveladze. 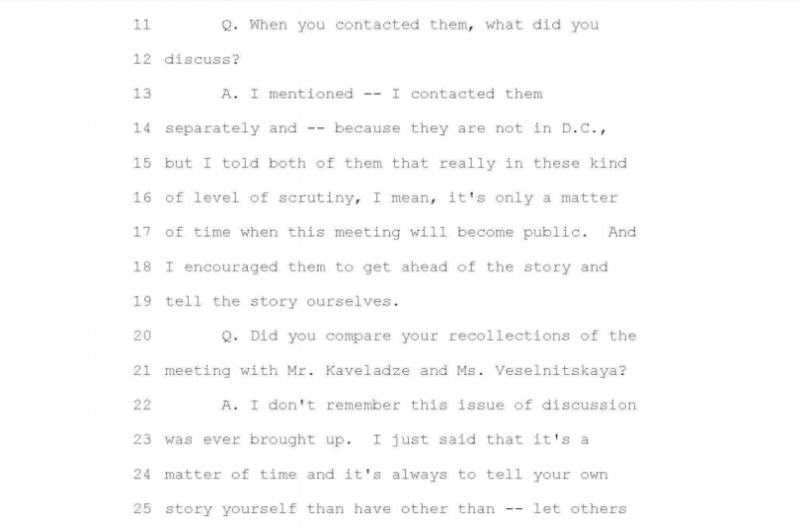 Kaveladze recounted in his own Senate Judiciary testimony having two phone conversations with Futerfas, one on June 27 and another sometime prior to that. Kaveladze said he told Futerfas what he remembered of the meeting. On their second phone call, Futerfas read to Kaveladze a statement recalling what Kaveladze told the attorney about the meeting. Futerfas said the statement wasn’t going to be disseminated and only was for internal use, according to Kaveladze. One June 30, Futerfas reached out by email to Emin Agalarov, which Agalarov forwarded to Kaveladze. Agalarov also texted Kaveladze that night to confirm Futerfas was Trump Jr.’s lawyer, and told Kaveladze that he and Futerfas were speaking by phone. Kaveladze texted Agalarov that Futerfas had just left him a voicemail asking to speak with him again. There would be yet another email back-and-forth between Futerfas and Kaveladze on July 7 about hopping on the phone. Kaveladze told investigators he couldn’t recall a phone conversation with Futerfas that day. The next day, the New York Times first reported the meeting.